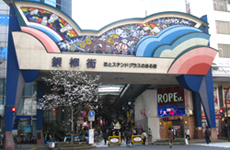 Coming straight off Keikyu Kawasaki station is the Ginza arcade. 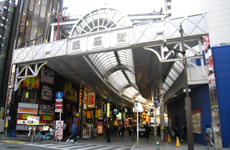 The Ginza Arcade stretches along the main street heading out from Kawasaki station, and also to the right along Shiyakusho Dori, in an L shape. Designed so that you never get drenched while out shopping or grabbing a bite.With around 30 shops lined up just for you, the area is a pedestrian-only zone closed to traffic through out the day. Many seasonal events are held here. Almost every weekend Ginza buskers," (the Live road show) also takes place and numerous artists from in and out of the prefecture perform in that. 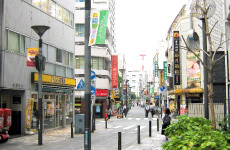 Tachibana-dori is just two minutes' walk from Kawasaki Station, with around 150 shops. 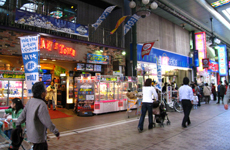 It is a shopping arcade that includes the Kawasaki city ward office and several financial institutions. In addition to the wide variety of Japanese restaurants serving sushi, ramen, yakitori (grilled chicken), Okinawa cousines, the area is also abuldant in Chinese, Vietnamese, Indian, Thai, and Italian cuisines. The streets have been made barrier-free over a three-year period, and are also easy for the elderly to walk around. 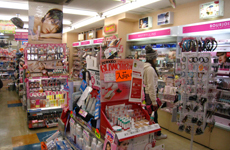 Fit for all ages, but on the top of every girl's shopping list, we stock the best Japanese designer cosmetics in all areas, sundries, medicines, and health snack foods at competitive prices. A haunt for the young at heart, equipped with car-racing games, crane claw games, and print club....it's all in one big fun center. And if that's not enough, swing over to the karaoke booth next door. 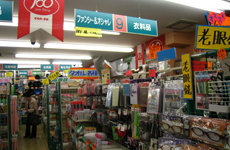 All products sell for 100 yen. Packed to the ceiling with every convenience good and provision that you can imagine. Big time hangout for the bustling businessman and penniless student. Fast food never tasted better and what a bargain! The rave of Japan for the past several decades, ramen has been served in a miso soup base, stewed pork soup base, or soy sauce soup base, with noodle varieties to keep your mouth-watering. Try one ramen shop or try them all to become a ramen connoisseur. Prices always fair and the food always tantalizing. Izakaya are where all folks go to wet their whistles, share all kinds of light fare with friends, and kick their shoes off in Japanese style. Local talent never sounded so good. 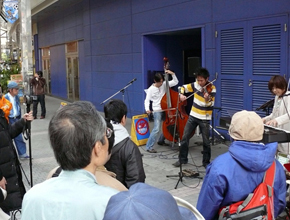 In the vicinity of the Ginza arcade catch the climax as street musicians put on half-hour shows per act. © City of Kawasaki, Kawasaki City Tourist Association. All rights reserved.